Rocio Sáenz is an SEIU International Executive Vice President after being elected at the September 2013 International Executive Board Meeting. Prior to her election, she headed the property services New England Local in Boston, which represents 18,000 workers in Massachusetts, New Hampshire and Rhode Island. 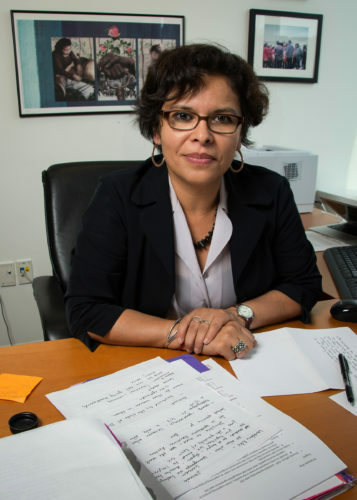 Sáenz has advocated for workers’ rights and community empowerment most of her adult life. She emigrated from Mexico to Los Angeles, where she initially worked low-wage jobs. Sáenz became an organizer for SEIU’s Justice for Janitors campaign in 1988, and she was part of a team that led a successful campaign to organize L.A. janitors. In August 2001, Sáenz moved to Boston to build the Justice for Janitors program there and to move the local union forward. A year later, she led thousands of Boston janitors on a month-long strike that drew widespread support from the media, clergy, politicians and community groups. The strike ended with an historic settlement that dramatically improved workers’ wages, benefits and workplace rights. In July 2003 Sáenz was elected President of SEIU Local 615 (Now SEIU 32BJ District 615), where she continued to win for workers and bring the immigration reform movement to the New England region. Her work on immigration reform and Latino civic engagement helped to drive the narrative and put Latino vote on the map. In September 2013, Saenz was elected to International Executive Vice President, becoming the first Latina executive officer. She now serves as one of the leading labor voices for Latino civic engagement and immigration reform.